In case you haven't heard, I'm thinking about changing the sshg_promptfest's winter format to a gifting opportunity or doing away with it altogether so that someone else might run a traditional gift exchange in the winter months. If you'd like to weigh in on the fest's future, please feel free to take the relevant poll. She has such a lovely coloring and those eyes are striking. That is such an adorable grumpy face. I love pets with expressive personalities. Yay for cat spam. 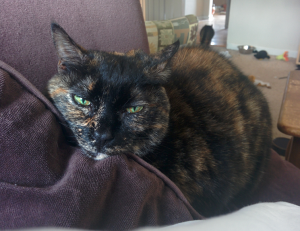 I used to have a tortie like her a long time ago.